Those who have ever read a novel set in the world of Jeffery Deaver know two things. First, he picks out an area of interest, learns everything about it, and then writes a thriller that moves faster than sports cars drag racing on the speed limitless Autobahns. With A Maiden’s Grave, he explored the worlds of the deaf and of Hostage Negotiation, and has continued to win awards, acclaim, and movie rights for his novels centered on criminalist Lincoln Rhyme. The second element: trust no one, especially the author, because even when you know he’s going to betray you, the problem is always how. In his latest novel, The Blue Nowhere , Deaver enters the world of the Internet. In Silicon Valley, a sadistic serial killer code-named Phate uses computers to stalk and kill his victims. His weapons are a long, curved blade, a computer virus called Trapdoor, and a sidekick named Shawn. As with any decent serial killer, each kill is a challenge, and each subsequent murder must be more challenging than the last. The California State Police Computer Crimes Division (CCD) frees world-class hacker Wyatt Gillett from prison. Gillett can make a computer board from miscellaneous pieces of junk and then make it work. His task seems simple: discover how Phate finds his victims, and how he gets into each of their computers. However, Phate is a genius to match Gillett’s own, and when the serial killer murders one of the CCD, Gillette is left to work with Detective Frank Bishop, a man who has more forensics savvy than computer intelligence. Not only does Gillett have to deal with Phate, he also has to tangle with a past that wants nothing to do with him, people from the Department of Defense who want to question him about problems of national security, and Shawn, Phate’s mysterious partner. And, as I mentioned, you should never trust anyone… except your book reviewer. Even with no interest in the Internet, the sheer speed of The Blue Nowhere is enough to make an average reader lose track of time and simply fall into the book. Deaver designs his characters and his world in such a way that they are as real as any in literature. The life story of each person is utilized masterfully, as Deaver both paints the background of their lives and twists it violently enough to wrench the book from your fingers. If this novel does not stimulate you, make you forget everything around you, and make you care for the people involved, it will at least educate you in what you never knew about the Internet, and were too scared to find out. It may even make you never want to use a computer again. I would call Deaver a master of his craft, but that would make this sound like an introduction for an award ceremony. 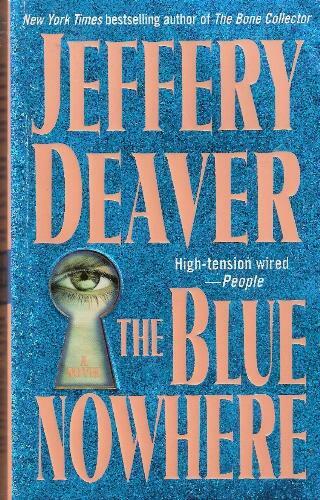 But The Blue Nowhere is a masterpiece of a thriller, with vivid detail, description, and plot fast enough to make a sonic jet look like the traffic flow on the LA freeway.